See also Filesystems, which are contained on Floppy Disks. 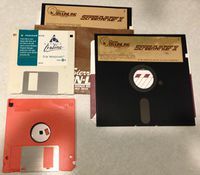 Some floppies, 5 1/4" and 3 1/2". Formats for images of floppy disk data can be found at Disk Image Formats. List of Floppy Disk Formats, Wikipedia. Michael Haardt et al's Floppy User Guide has some information on physical, magnetic, etc formats. One of the computers that would receive a nuclear launch order from the President still uses 8" floppy disks. See also Disk Imaging Software & Systems.